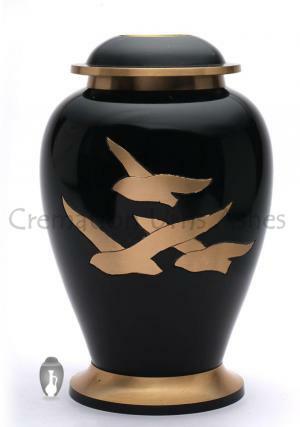 Large adult urn for human ashes is layered in black with gold enamel. The creamy layer on the urn is filled with gold flying doves which represent calm and peace to the demised. 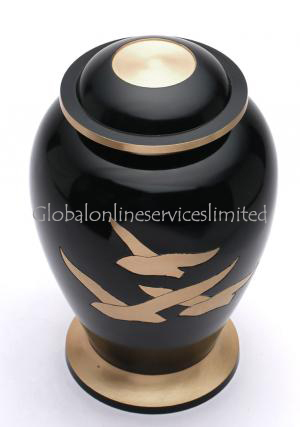 The adult memorial urn is well designed which shows the artwork of skilled professionals. Funeral urn is covered with gold rim at the bottom to make the urn stand. 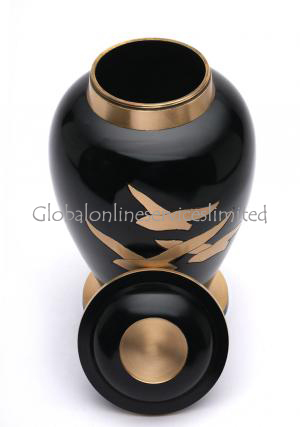 Memorial urn has flat semi circled lid with gold finish on edges and at the center with a threaded lid for a secured storage of ashes of the cremated. 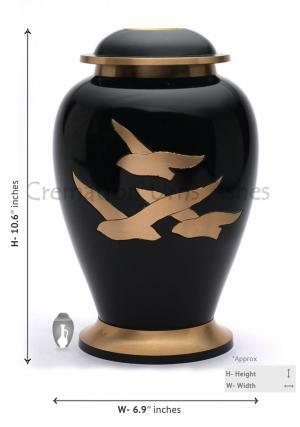 Adult cremation urn presents nature of the birds moving towards the final destination. The storage of cremation ashes in the urn would be a great present for the final memorial. The quality is made by professional artworks presenters who are capable of providing purity in their work which mesmerizes one to store ashes of the loved one. Going Home Black Adult Urn weighs (approx) 2.3 KG and measured to a length of 10.6 inches tall which is capable of storing adult cremation ashes.